Expanded area: MacKillop Catholic College surges ahead with its plans to be the birth-to-Year 12 school. 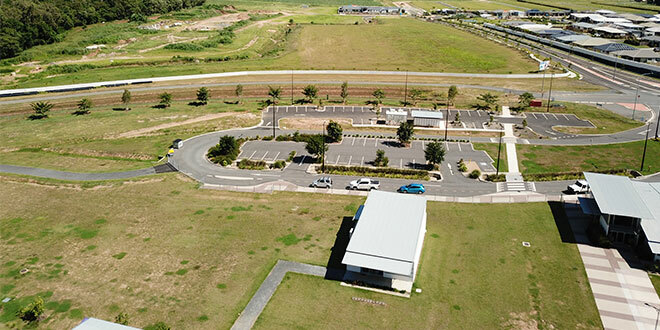 PLANS are going ahead as MacKillop Catholic College, Mount Peter, sets itself up to be the birth-to-Year 12 solution for families in the Cairns southern growth corridor by 2025. Catholic Early Learning and Care, Mount Peter, has plans for mid-year construction in readiness for an early 2019 opening. Year 7 will open in 2020 with Year 12 being available by 2025. The Long Day Care Centre being established on the grounds of MacKillop Catholic College was thanks to a $2.5 million investment by Cairns Catholic Early Learning and Care. The new facility will cater to young children through to school age, including babies, toddlers and kindy children, and will be situated adjacent to the college’s Prep unit playground and near the Outside School Hours Care facility. Catholic Early Learning and Care’s landscaped gardens will allow day-care and Prep kids to interact in a safe and natural environment. A kindergarten program for four-year-olds will prepare them for the smoothest of transitions into school. Principal Luke Reed said the college just kept getting bigger and better. It started with 80 students in 2016, it grew to 170 last year and has 285 this year. “There’s been a lot of demand,” Mr Reed said. “At the end of last year we decided to increase our classes, so this year we have three Prep classes and three Year 1s and two groups each in Years 2-5. Staff numbers have risen from 33 last year to 45 this year. “The rapid growth presents wonderful opportunities, but there were also some challenges mixed in with that,” Mr Reed said. “When we started in 2016 with eighty students and five classes it was a very intimate experience, and that feel of a big family is something we have worked hard to maintain as new families and more children come in. While the southern corridor expands and draws more families into the region, the provision of a Catholic education at the school has enhanced the school numbers. “Our popularity is also due to word of mouth,” Mr Reed said. Other factors play a part in MacKillop’s popularity. A new junior play oval has almost been completed, and the school has added an instrumental music program as well as an arts program this year. “This new oval means a wonderful play area for the children, so that’s very exciting,” Mr Reed said. After trialling an instrumental music program last year, this year has seen the beginning of the school’s music program. The school brought in a part-time arts teacher this year for its new arts program. Moving forward, the school has been working towards its Stage 3 infrastructure for additional primary school spaces and initial secondary school facilities in 2020. Mr Reed encouraged parents with children at other Catholic schools in the area, including St Michael’s, Gordonvale, and St Therese’s, Bentley Park, to not move their child out of fear of missing a place at MacKillop for secondary schooling. High demand for Year 7 enrolments across Cairns Catholic colleges had meant that the college’s planning was directed towards a four-stream facility from 2020, he said.